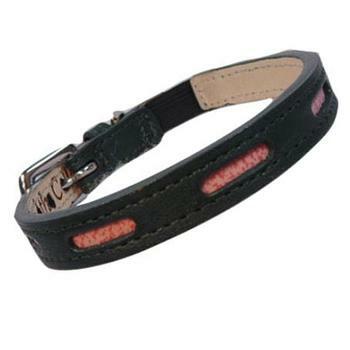 The genuine leather Milton cat collar with rectangle leather cutouts and custom stitching is a nice way to be creative. Select from the large selection of leather for the main collar color and then the insert color, as well as the stitching color, which can either match the collar color or the insert color. The edges of the collar and the sizing holes are all hand painted to create the finely made product your cat deserves to wear. Each collar is lined with vegetable tanned leather to create extra comfort and longer life. There is a nickel D-Ring near the leather loop to attach an ID tag and elastic near the buckle to provide stretch for those mischievous cats. 8" x 1/2", 10" x 1/2", 12" x 5/8"